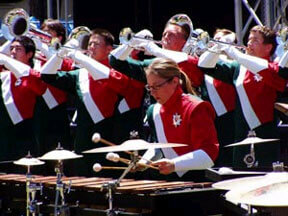 From the Santa Clara Vanguard Web site: It's June, which means the drum corps season is here! For those that live near a drum corps, you've probably already attended one of the daily rehearsals many corps have already started. SCV performs a standstill performance at the Sacramento Jazz Jubilee on Memorial Day. For those wondering when they will be able to see SCV in rehearsal – the time has finally arrived! We will start our daily rehearsals this Friday night (June 6) at 6 p.m. If you missed the performances by SCV over the Memorial Day weekend in Sacramento, Calif., you can listen to an MP3 of the performance embedded in this page (second paragraph, first hyperlink). You can also catch their Family Day performance this Saturday, June 7, at the SCV Hall. We will perform a standstill concert following the SCV Booster Club meeting. The afternoon will kick off with our Vanguard Cadets performing their 2003 show. The Vanguard will then take the stage (the pavement, in this case) to perform our 2003 show. Everyone is welcome to attend this event, as it is open to the public, as is our booster club meeting that starts at 10 a.m. There will also be a barbecue lunch provided for everyone afterwards. The corps will continue rehearsing after lunch and through the evening on Saturday. This will be the last day the corps will be in the Santa Clara area until we return to the Bay Area for our home show -- Pacific Procession -- to be held on June 28th at Cal State Hayward. The corps' first week of daily rehearsals will take place up in the Sierra foothills at Placer High School in Auburn, Calif. The corps will be holding a clinic for local band students, which is free and open to the public on Thursday June 12 at 7 p.m. After a week in Auburn, the corps will make its way to Bret Harte High School in Angels Camp, Calif. For those that will not be traveling to Southern California for our first competition on June 20, you'll be able to see the first full performance of the entire 2003 show before we leave Northern California in Angels Camp on Thursday June 19 at 7 p.m. We will be posting our mail stop info as well our tour itinerary on the Web site soon, so stay tuned!